Earn extra money: This is the part where you need to “expand” your operating budget by making more money. I don’t mean getting a second job, but I mean starting a micro-business and making some one-time and temporary cash. Save: Put 80-90% of the extra money you earn into a special savings account. Make it had to withdraw the money so that you won’t be tempted to blow it on something stupid. Use the remaining 10-20% to pay down debt and give yourself a little treat. Reduce (not raise) your monthly expenses: Get rid of gym memberships you don’t use, cell plans that aren’t in your best interests, and renegotiate cable or energy contracts if you can. Fight against the temptation to raise your monthly expenses even as you make more and more money. Buy a Forever cash asset: after you have enough money in your special seed money savings account, purchase your first Forever Cash asset. Cash flow to seed account: Put the money from your Forever Cash asset into your seed money bank account – don’t touch it yet. Now keep repeating the steps of the Wealth Wheel, faster and faster each time. Purchase one, then two, then four, then six, then ten Forever Cash assets until you have enough cash flow coming in to cover your monthly expenses and then some. Then you will have the option to retire and live off the money from your assets and then to buy some toys with whatever extra you have, knowing that more money is always on its way. You can get to the point (like my wife Michelle and I are at) where every time you take a vacation you know that there will be more money in the bank account when you come back than there was when you left. 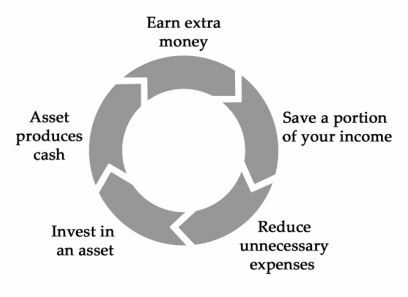 The Wealth Wheel couldn’t be simpler, and yet it is the most important way to put the Forever Cash philosophy into action.